Awesome news from the Google Geo Developers Blog. Can’t wait to see the spring, summer, autumn and winter maps that will be created. And I even know someone who always wanted Heavy Metal maps – no more need to wait for this to happen. Dive into the Google Maps API V3 and make it happen. Dieser Beitrag wurde unter Google Maps abgelegt am 21.5.2010 von admin. The metaphor „dive into the map“ was never more applicable than today, given the seamless integration of 360 panorama imagery with earth viewer technologies from Google, Microsoft & Co. Dive into the map and explore thea area around to discover all the fascinating things that places have to offer. Discovering geographic information through different user interfaces and user interface metaphors is a topic I have been interested in for a long time. Users have their individual cognitive styles and a user interface that may be well suited to some of us may be tedious to use for others. Some explore and discover by reading text. Others prefer browsing image galleries or watching videos. And some of us prefer to explore the area – explore places – through a map. A map is a neat way to understand geography and it provides an exploration experience that can can be heaps of fun – especially when the concepts of information scent are integrated into the mapping experience. Dieser Beitrag wurde unter Explore abgelegt am 19.5.2010 von admin. Check out this awesome Google Home View „making of“ via Google Maps Mania. Thanks for this. That made my day. Dieser Beitrag wurde unter Google abgelegt am 16.3.2010 von admin. There are enormous amounts of geodata rotting away on hard drives all over the world. So far businesses like GeoCommons, WeoGeo or Koordinates (affiliated) have started to organise some of these data, make them findable, accessible, and even shoppable through their cloud based infrastructure solutions. However, in think-big mode, there is nothing like an iTunes of geodata out there yet. Where do you go to shop for geo apps or geodata? – Amazon? iTunes? eBay? I don’t think so. Spatial Data Infrastructures are being built up worldwide. Remember that Google, as well, is already working hard on the Google Spatial Data Infrastructure. Today, finding geo apps or geodata when you actually need them, is still cumbersome. But is there actually something like a „market“ for geodata? Geodata appears to be free everywhere. Open Street Map provides free mapping data – Google, Microsoft & Co provide free maps. Even self-announced GIS market leader ESRI – or shall we better call it the new GeoDesign market leader – provides loads of free geodata. Geodata increasingly appears to become part of the enabling fundament for a broad range of business models. In order to support their advertising business models, Google, Microsoft & Co have disrupted the GIS market in many aspects. Free geodata and free geo apps from the big players have made many „geo-magic“ business model from „the time before“ superfluous. The latest disruption in the navigation market nicely shows how „…the candy they give away to you…“ – as Paul nicely put it in an argument about how even ESRI is using geodata to support their software business, often is „geo-candy“ – geodata or geo apps that are available for free. Nonetheless, Apple’s App Store proved that there is a sound business model in selling Apps -So I am excited to see how the geo-corner of the Google’s new Apps Marketplace will do. And since geo apps are only fun when fuelled with geodata I would be surprised if there wasn’t a solid business case for a Google Data Marketplace selling geodata. At least for professional geo apps and geodata, there should be some beef left. Dieser Beitrag wurde unter Geodata abgelegt am 14.3.2010 von admin. The latest post on the Google Lat Long Blog presents a neat new way to visualise big piles of data on a map. Pretty cool that they chose an example with bike trails to explain what can be done with Google Fusion Tables. The MTBGuru blog has more details along with maps and screenshots on their site. I think that we will give this a try at work and see if it may be an alternative to a more traditional clustering approach that we are using for visualising many thousand trails on a Google Map at the moment. One problem I see with the approach of simply drawing all the tracks on a map is that there are many sections, where you will have overlapping tracks. Most of the tracks are GPS tracks that are not snapped to a network and you end up with tracks on top of tracks on top of tracks. A spaghetti trail map. If the trails were modelled as a network, then it would be cool though if you could just click on a part of the track network and have suggested tours come up that pass the section of the network you just clicked on. Dieser Beitrag wurde unter Google Maps abgelegt am 25.2.2010 von admin. Far from perfect snow conditions, but nevertheless – A great skitour early in the morning. Who needs GPS to tell you how high up you are, when you have signs that tell you right on the spot. Skitour trail data, including ski lifts and runs, as well as a gradient layer, that shows steep danger zones. Dieser Beitrag wurde unter Skitour abgelegt am 3.1.2010 von admin. Dieser Beitrag wurde unter Location based services, Uncategorized abgelegt am 27.12.2009 von admin. Yesterday, we released another cool feature for all our outdooractive.com users. Our platform already features a few thousand top-notch tours – no matter what kind of outdoor sports you are into -there are plenty of hiking tours, bike trails, skitours and many more things to explore and discover. At this stage, we only offer a German user interface, but we’re already working on supporting an English UI as well. The platform already enables users to publish their favourite outdoor tours in a very professional way, including an interactive tour map, an elevation profile, descriptions and an image gallery. For skitours, there is even a layer, which shows steep slope angles as potential danger zones with a red coloured map overlay. Now, users can also grab an IFrame and integrate it on their own website or blog. People can then check out a summary of the tour and even switch to a Google Earth 3D view to get a better idea about what to expect from the tour. 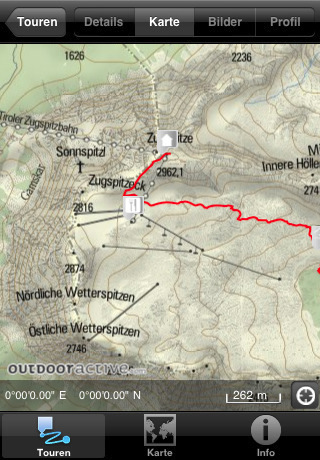 The following example shows a skitour from Scharnitz to Pleisenspitze. Also note the outdoor cartography, which fills in all the white spots that you find in Google Maps when it comes to the Great Outdoors. Dieser Beitrag wurde unter outdooractive.com abgelegt am 5.12.2009 von admin.